This article is for those who wants to make their own car amplifier. The basics of calculation will be discussed below. If you have understand it you will be able to make car amplifier yourself. Actually the difficulty of designing the car power amplifier does not lies with the audio power amplifier, but it is more to providing the switching power supply. where Vpp= peak to peak supply voltage, Rl is the speaker impedance load. For car voltage of 12Vdc, if we connect it to 4 Ohm speakers we will only have power of 144/32 = 4,5 Watt. Bridging the amplifier will double the power, but will never be more than 40 W.
If we want to make more powerful amplifier, lets say 170 watt at 4 ohm speaker load, we will need supply voltage of 74Vpp, or +/- 37 Vdc. The way to have this voltage from car supply of 12VDC is to make DC-DC converter. 3. Miscellenous tips for making car power amplifier. First stage is the stage that receives the input audio signal and Negative Feedback (NFB) signal from the output of the amp. Feedback is the back signal used to stabilized the audio amplifier, like the gain factor. For first stage built by discrete transistors, both signals is fed to basis of the transistor, like in fig1. Both basis of the transistors is the Non- Inverting input and Inverting Input, like those in the op-amp. Second stage is the stage that responsibles for the Voltage Gain in the power amplifier. Third stage is the Current Gain. 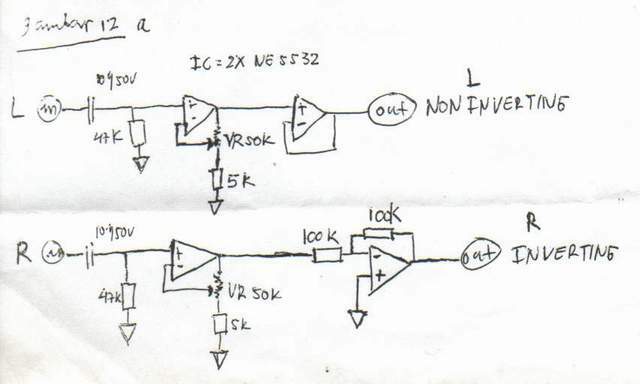 The first stage receives this signal in the non-inverting input and the inverting input receives NFB signal to make sure the voltage gain that the amplifier produces has a constant number, lets say 28 x. The output signal from the first stage has not reach 28Vpp, it tends to have the magnitude similiar to the input voltage. Second stage amplifies the voltage that the first stage generates. 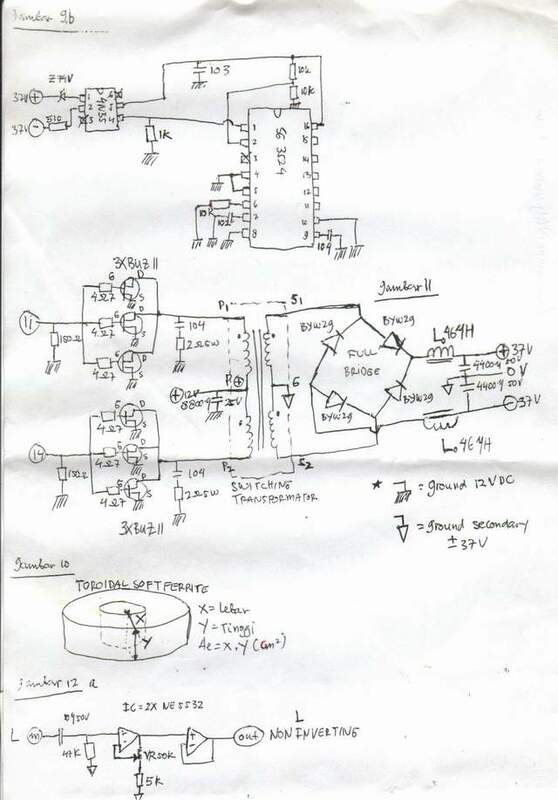 Second stage will amplifies the voltage to produce a signal that is enlarge 28x for the amplifier to have a 28Vpp signal from 1Vpp signal, but this 28Vpp signal still have small current , only a few mA and cannot drive the speaker load. The third stage amplifies the current from few mA to 6.5 A.
Offcourse the explenation for three stages above is not that simple in the real amplifier. We should take the nature's law for a transistor gain, that is G=RC/RE. This principles must be applied in each transistor in those 3 amplifier stages. First stage designs have main component, that is Constant Current Source (CCS) which can be seen in fig2. One of the basic of electronic law that works on every circuit is that the voltage drop of Basis and Emitor (Vbe) equals the drop voltage of one dioda = 0.67V. It can be seen in fig2 that the voltage drop of 2 dioda IN4148 = 2 x 0.67V = 1,34V. We can see in RE and Q1, then V=0,67 is substracted by Vbe of Q1 and the other 0,67V will be the drop of RE. So we will have a Constant Current Source of 0,67/RE. In fig2 the Ic is = 4,4mA. CCS first stage varies between 1-4mA. - Q3 and Q4 is the Current Mirror that ensures the current in RM1 and RM2 will have the same magnitude. - RF and CF will be discussed later. Before we discuss Second Stage and Third stage, first we will discuss the amplifying effect of a transistor. In fig3a we will see a circuit of Common Emitor Mode (CEM). This circuit will amplifies the voltage. In fig3b we see a Common Colector Mode (CCM). This circuit is the current amplifier without voltage amplifier. So if we want to amplifies voltage we use CEM circuit and to amplifies current we use CCM circuit. In the second stage there is an important capacitor for an audio power amplifier , that is Miller Capacitor (CC in fig1). CC defines the pole of the frequency response for an audio amplifier and the magnitude usually in small order (severalpF). Bias control circuit consist of a transistor, resistor and a VR like in fig5. This circuit uses a transistor that is placed in the heatsink, because the transistor have good heat compensation factor (for bipolar transistors). For the amplifier that uses mosfet transistor for the final device, the bias circuit only needs potentio or dioda only because mosfets have different heat characteristic than bipolar transistors. The bias voltage magnitude depends on the type of the third stage used, which will be discussed later. Third stage / Output Stage is the current amplifier. Third stage and the bias circuit will defines whether an amplifier works in class A, class AB or class B. It can be said that almost 90 % of car audio power amplifier works in class B. Operation in class B does not mean that the sound produced is not good or corrupted. With good design, we will have good audio results, both from class A or class B. The choice of class B in car audio power amplifier is conected to efficiency and the heat generated. Heat generated is a very important factor, because if not considered carefully, it will lead to amplifier breakdown. Many configurations of the output stage can be seen in fig4. Each configuration has different optimum bias voltage. It depends on how many Vbe's that have to be passed. Example : In fig4(a) the signal has to pass 4 Vbe's, which is Vbe Q1, Q3, Q4 and Q2. So the optimum bias = 4 x 0.67V = 2.8V. - The value of Negative Feedback (NFB) resistor is determined by determining the gain factor with the equation : Gain = 1+(R10/R8) = 1+10k/500 = 21 x. The value of R10 = value of R1 to balance input. R20 and C7 are the pole and slope compensator. - C2 limits the DC gain factor, value ranging from 47-220 uF, usually using a nonpolar capacitor. - R21, R22 and C11 will stabilize CCS. Here we use CCS with 2 transistor system,but the equation used still the same, that is Ic = 0,67/RE . - The output of differential pair tapped from collector of T10 and send to VAS which is built by T12 and T4. This configuration is called Darlington VAS and the value of R8 is standard. - C3 is the Miller capacitor with value of 100pF. - R18, C6,L1 and R19 are output power stabilisator. If there is any oscilation occur in the audio power amplifier, the first tobe effected is R18 besides the final transistors. Car Power amplifier usually loaded by low impedance speakers, usually 4 ohms and can reach ½ ohm on bridge mode. Here we know the term “High Current Amplifier”. The difference is the number of final transistors, or in fig5 it is the number of pairs of T7 and T8. As a rule of thumb, the number of transistor needed first has tobe calculated by equations above, and then we determine the number of final transistor needed with assumption that 1 transistor can handle 50 Watt output. A pair of bipolar transistor can handle 100 Watt. The power is raised by parrarelling several output transistors, so the currrent flowing will be larger. For large number of final transistors, we change the predriver stage with darlington configuration. Several designs uses symetrical design, like those used in AXL and Crescendo schematic. this design is developed from the basic principal above, but the signal handling for + and - part is handled by complementary circuits. I have an example about another kind of power amplifier, that is a non-feedback amplifier. You can view the principles of the "millenium power amplifier" in the www.lcaudio.com . This amplifier has a certain gain factor in first and second stage, while the third stage is only current amplifier. For building car power amplifier, we need symmetrical power supply (+, 0, -) by building DC-DC converter. The converter system discussed below will be the SMPS(Switch Mode Power Supply) type PWM (Pulse Width Modulation). This system will deliver stable output voltage, regardless of the input voltage (usually the car electrical system will range in 9-15Vdc). To explain the SMPS type PWM, it can be analogued by the next example. Look at fig6. There is a voltage pulse V1 on-off with 50% wide. These pulses if passed through suitable L and C filter will be transformated into straight voltage of V2 which is V2 = ½ V1. (noticed the marked area below pulsed V1 is the same total area of the marked straight V2 ). With the same logic, if the pulse width of V1 is narrowed, we will have a lower V2 and if we enlarge the width of V1 pulse, we will have higher V2. Some may ask, how can we get 30VDC from the car's 12VDC? The answer is simple. If we get the V1 voltage to 60VDC, then in the 50% duty cycle, we will get 30VDC straight. This is the part where the power switching transformer takes control, to make the 60VDC from 12VDC, and then chopped by the PWM. This is the princip of PWM. (Like the principal of class D digital power amplifier). In this design, we use regulating PWM IC's, like TL494, TL594, SG3524, SG3525. These IC's will compare the output of DC-DC converter with a reference voltage. If the output of DC-DC converter is smaller than reference voltage, then the IC will enlarge the pulse width so the voltage will raise equally to to reach determined voltage. So as if the output of DC-DC converter is higher than the reference voltage, the IC will narrow the pulse width so the output voltage will be lowered to the determined voltage. Generally SMPS used in car audio amplifier is the push-pull system with switching frequency between 20-70Khz. In push pull sytem like in fig7, Q1 and Q2 gives alternating switched current pulses so the transformator will be objected to maximum flux swing change without saturating the core. In this design we will use PWM IC with SG3524 from SGS Thompson. Specifications can be seen in SGS Thompson's website. Fig8 shows the configuration of 16 pins on this IC. To make is simpler, lets design a SMPS by explaining the function of each pin. For the stereo power amplifier in fig5, we will need a SMPS 12Vdc input and summetrical output of +/- 37Vdc with 8A rating. 1. First we make the Remote Turn On circuit , which is connected from the car radio / CD player. The circuit can be seen in fig9a. This circuit will turn on the SMPS by giving 12Vdc to pin 12, pin 13 and pin 15. 3. Pin 2(Non Inv In). In pin 2 we put stable reverence output for the SMPS. Here we use reference voltage of ½ from reference pin 16. 4. Pin 1(Inv In) is the output voltage detector . Pin 1 is connected to the optoisolator type 4N35 like in fig9b. Optoisolator is an important component in making this SMPS so we can have Floating Secondary Ground which will prevent noises (especially whine/storing) if the power amplifier is placed in car. The value of zener diode is 2 x 37V = 74V. If it is difficult to have zener voltage of 74 V, then we can series several zener values until we have total of 74 V.
5. Pin (4) and pin(5) are not used and connected to ground, pin(8) and pin(10) connected directly with ground. 6. Pin no 9(Comp) determines slope and pole of feedback from the whole SMPS system. In this design we use only 1 capacitor of 100nF. 7. Pin no 16(Vref) gives reverence voltage of 5,1 Vdc . This pin is placed with 10nF as a voltage stabilisator. Vr = 8 x 10-6 x I / Co. With I = 8A and Vr = 0,029V we will have Co of 2.200uF in +37Vdc ->-37Vdc rail or 4400uF each in +37Vdc_0 and 4.400uF in 0_-37Vdc. 9. For output filter capacitor of 2.200uF, we will need approximately 4x 2.200uF or 8.800uF in the SMPS's input 12Vdc . The larger the value of this capacitor, more energy stored for the SMPS. 10. Output filter inductor Lo is determine by : Lo = 0,5 x Vout/ (I x F). With Vout = 2 x 37V = 74V, I = 8A dan F = 50Khz, we will have Lo = 0,092mH or Lo = 0,046mH on each supply rail + and – 37Vdc. 11. Pin 11 and pin 14 are output pins that will drive the primary winding switching mosfets. Inside IC SG3524 both pins have already opereated in mode push-pull. The circuit for driving power mosfets can be seen in fig9b. The number of power mosfet used is 3 in each transformator primary. So total there is 6 power mosfets type BUZ11. (1) Np = 1,37 x 105 / (F x Ae), where Np= primary number of turns, F = switching frequency, Ae = X x Y = window area of ferrite in cm2. Look at fig10. To make it easy to wound the transformator, we will have to choose the toroid core with minimal diameter of 2,5 cm and window area minimal of 0.75cm2.This is necessary for the easyness of self handwound. Remember that in push-pull system there is 2 primary windings. (3) Ap = 0,004 x Vo x Io, where Ap = window area of primary wire in mm2, Vo = output voltage, Io = output current. (4) As = 0,13 x Io, where As = window area of secondary wire in mm2. Example : If we use toroidal ferrite core with window area of Ae = 1 cm2. then from equation no. 1 we will have number of primary turn Np = 1,37 x 105 / (50Khz x 1 cm2) = 2,74 turns. In practice, number of minimal primary turns is 4 so the primary will cover the whole toroidal core. So we use 4 turns for Q1 and 4 turns for Q2. Equation (4) is used to determine the number of wire needed for secondary windings. We have As = 0,13 x 8 = 1mm2 So if we use wire magnet with diameter of 0,8mm(window area = 0, 5mm2), then we will need 2 wires with diameter 0,8mm for each secondary windings. 13. The secondary output voltage is rectified by full bridge configuration like in fig11. Bridging diode must be the type of fast rectifier, usually looks like transistor TO220 with plate heatsink. For SMPS we cannot use ordinary 50/60Hz rectifier diode. For this design we use diode type BYW29-150, which have rating of 8A, 150V. We can also use other diodes like with prefixes FE…,MUR..., as long as it is a fast rectifier diode with minimal specification like above. Car power amplifier has specific accesories like preamp gain circuit, an inverting channel so that the power is bridgeable. These functions usually done with opamps. The circuit can be seen in fig12a and the supply circuit can be seen in fig12b. The circuit is placed before the audio amplifier circuit. - First we wound the secondary winding of 4 wires of 0.8mm magnet wires at once with 17 numbers of turn. The turn can be made in any direction as long as we consistent with the direction of the wound. If we have finished wounding it, the toroidal core will look like fig13a. We named the wires with wireA,B,C, and D. If we start the wound on top of the core, the end will be at the bottom of the core. Make sure each wire edges with AVOmeter. Connect start edge of wire A and B to point S1 and the end edge of wire A and B to point G. The start edge of wire C and D is connected to point G and the end edge of wire C and D is connected to point S2. Point G will be the secondary ground of the power amplifier and point S1 and S2 will be connected to bridging diode of BYW29. If you have finished winding the primary and the secondary, the whole transformator will have the same wire directions like in fig12e. Connect point P+ to the +12VDC of the car battery, point P1 to the drain of power mosfets Q1 and point P2 to the drain of the power mosfets Q2. 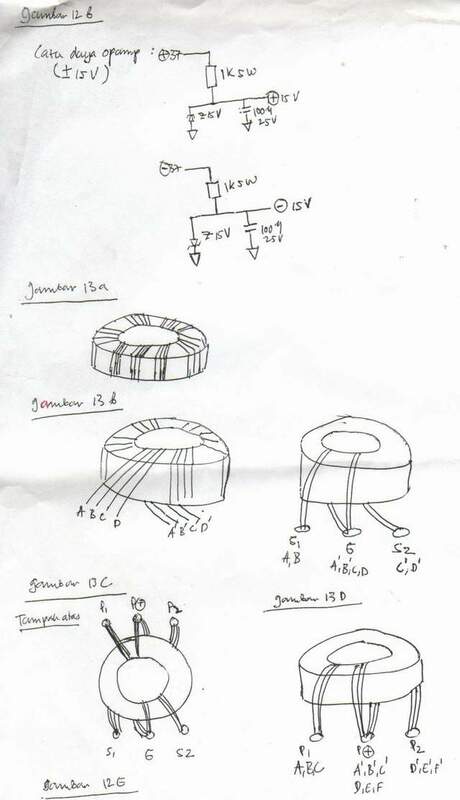 It is important to remember that all tracks in PCB layer that is connected to the power transformer has to have sufficient width due to large current will be involved. Also it is better if we soldered those tracks to have more current transfer. After finishing winding the transformator, place all the rest of the component and finish assembly of the SMPS. You can test it by connect it with 12VDC input from the battery. Don't forget to connect the remote turn on with 12VDC. There should be output voltage of +37V, 0 and –37V without any large current draw in the 12VDC line. Check for any mistakes, if the output voltage do not present or if the SMPS draws large current from 12VDC input. In the assembly process of car audio power amplifier, we have to pay attention in mounting all transistors to the heatsink. We must use sufficient heatsink surface so the heat won't damage the amplifier. Use mica isolator and white silicon pasta to make sure the heat transfer. Firmly tighten all the bolts to press all the transistors. Car amplifier works in vigorous environment like in the trunk of a car. Placing an extra fan always a good idea in making car power amplifier. After we connect the SMPS to the audio amplifier, we are ready to test the car power amplifier. First trim the bias potentiometer fully left side to have minimum bias. Turn on the SMPS and look for the current draw in 12VDC line with ampmeter. The ampmeter indicator will raise for a moment to fill all the capacitors. After a few moment, the ampmeter indicator must turn back to minimum indication of ampere. If not, there is some problem. Then we trim the bias to optimal point. Usually for car stereo power amplifier total quiscent ampere will not exceed 2A of 12VDC line.